Outlook is a Personal Information Manager (PIM) application from Microsoft available both as part of MS Office suite or as separate application. Outlook found its identity as Offline Mail Accessing Program and becomes popular as a mail client application. Outlook serves a user with calendar, tasks-manager, journals, to-do lists and web browsing capabilities aside mail synchronization (Send/Receive). What is the Outlook Data File? What are the types and extension of Outlook data files? The data file used to store the complete items of a Microsoft account are known as Outlook Data files. There are two types files, Outlook has i.e.PST (Personal Storage Folder files) & OST (Offline Storage Data files) and these are saved as .pst and .ost. What is the difference between Outlook PST & OST files? When the MS Outlook account is configured with IMAP, POP3 and web-based mail accounts then PST file is created. On the other hand, OST files are used when the user has an Exchange account and wants to work offline or use the default Cached Exchange Mode. This Outlook data file (.ost) is also used for accounts that are set up with the Outlook Connector for Outlook.com. OST files are the copy of items saved on the mail server, so it is not needed to backup these files like Outlook Data Files (.pst). What is the by default location of Outlook data files? What are different protocols used in MS Outlook? Post Office Protocol version 3 - POP3 is a standard mail protocol used to receive emails from a remote server to a local client. POP3 allows you to download email messages on your local computer and read them even when the user is offline. Simple Mail Transfer Protocol - SMTP is the standard protocol for sending emails across the Internet. The Internet Message Access Protocol - IMAP is a mail protocol used for accessing email on a remote web server from a local client. IMAP and POP3 are the two most commonly used Internet mail protocols for retrieving emails. What is the default ports number in Microsoft Outlook for POP3, HTTP, & SMTP? Port 110- a default POP3 non-encrypted port. Port 995- this is the port to connect using POP3 securely. Port 143- a default IMAP non-encrypted port. Port 993- to connect using IMAP securely. Port 25- a SMTP non-encrypted port by deafult. Port 2525- opened on all SiteGround servers and in case port 25 is filtered then to send non-encrypted emails with SMTP. Port 465- to send messages using SMTP securely. What is Microsoft Outlook safe mode? There are many applications which provides safe mode option to enable people to execute the programs with limited functions. Running a program such as Outlook in the safe mode helps you to resolve problems quickly. There are various errors like sending-recieving problem, file corruption that could be resolved. What is Outlook journal used for? Journal keeps a track of any interaction that the user wants to remember. Journal automatically record the actions that we choose which relate to specific contacts and puts them in action in a Timeline view. Journals keeps track of all the Microsoft Outlook items, such as mail messages or meetings. It can also track other MS Office files, such as Word documents or Excel workbooks etc. What is Outlook auto archive feature? Auto Archive option helps to manage the space in your mailbox or on the e-mail server which you are using by automatically moving the items to an archive location in order to manage the space. What is Outlook autodiscover feature? Outlook Autodiscover service is to establish the initial connections to the Exchange user mailboxes. If the connection get established then it also helps Outlook to access Exchange Server features. What is Outlook Business Contact Manager? Microsoft Outlook with Business Contact Manager only comes with Outlook 2013 edition. It is a great customer relationship management tool for the business owners because they can use it to improve the effectiveness of their customer service, sales, and marketing efforts. What is Microsoft Outlook blacklist? Outlook Blacklist is the list of SPAM emails recieved by the account holder which is not important and just occupies the memory of the Outlook account. Microsoft Outlook Anywhere is a service provided by the Client Access server role. 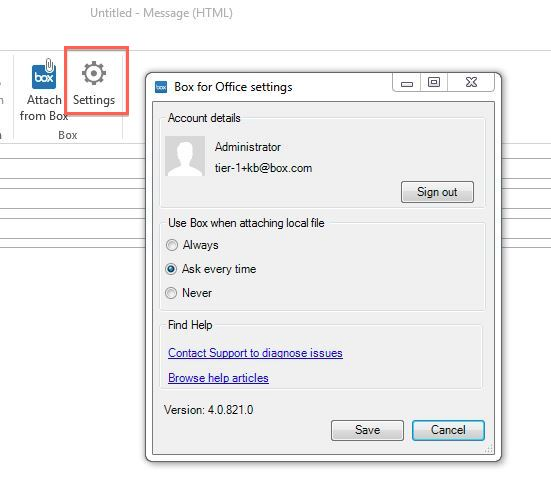 This application allows the Outlook users to make a secure connection over SSL/HTTPS to the mailbox from the remote locations. Basically, it is a feature that allows the Outlook clients to access the corporate emails as well as calendars over the Internet from outside the corporate domain without loging into a virtual private network (VPN). Select the gear icon labeled Settings. It is next to the icon "Attach from Box". This allows you to sign out of your Box account as well as determine how often your attachments are saved straight to Box. What is Outlook Cached Mode? The Outlook Cached Mode is basically a copy of the mailbox saved on the system of the user. This mailbox copy provides a quick access to the data, and is frequently updated with the server that runs Microsoft Exchange. The Outlook Calender is a feature that provides the Outlook user to keep the complete records of the meetings and remainders. It helps to manage the schedule for the particular user. The Outlook Connector is used to access and manage a Microsoft Office Live Mail account or a Windows Live Hotmail account. What is Microsoft Outlook 365? Outlook 365 is an email client of the Microsoft Office 365 suite. It is same as MS Outlook that is installed on our local system. What is the difference between Outlook & Outlook 365? Outlook is an desktop-based email application and when we use Outlook in Office 365 account it is known as Outlook 365. What is the location of Outlook data file on Mac? ~/Documents/Microsoft User Data/Office 2011 Identities/Main Identity. Under that directory, the e-mails are stored in Data Records/Messages. There are no PST and OST files used in Outlook for Mac. What is the Mac Outlook data file extension? Instead of a PST or OST, Outlook for Mac client stores its data in OLK file format, i.e. OLM file. This file is not created by default but has to be generated using the means of export featured by the client. What is an OLM file? OLM file can be termed as a Mac Outlook backup file. This is the data file generated by Outlook 2011 for Mac OS X. Since, we get the extension .olm after exporting the data from MAC Outlook. Locally you will get OLK file arranged separately for every identity like message, contacts, etc. This data file is also a proprietary of Outlook 2011 for Mac and can only be access/read by the respective application. What is OLK file format? The Outlook 2011 for Mac client was released as part of the MS Office Suite 2011 version, which was introduced exclusively for Mac OS. The client uses the backend OLK14 MESSAGE file for when a message is read on the client end by the user. The OLK file format only stores the corresponding message header data (only). What is the difference between OLM, OLK14, and OLK 15 message files? OLM file is the backup file of Mac Outlook and it is generated by Outlook 2011 for Mac OS X.
Mac Outlook 2011 uses the backend file OLK14 MESSAGE when the user reads a message is read on the client end. This OLK file format stores the header data of the corresponding message only. "I have been assigned a new product related to Outlook and I haven't done anything on this email application, even I didn't know that it is an email client of Microsoft. This site helped me a lot to know what is Outlook exactly and how to work on this email client." "We really want to thank the technical team of OutlookFaq for all the provided information related to Outlook. We want to know that what is the safe mode in Outlook and for what purpose is it used? Thanks OutlooFaq team." "I must say that outlookfaq.com answers all my Outlook related questions. I was a bit confused that what is the difference between the Outlook data files and their extensions. Thanks to you guys for clearing my doubts." "Recently I have joined a company and here the email client is Microsoft Outlook. One of my friends recommended to go through outlookfaq.com and this site has described all the small details about Outlook which has cleared my all the doubts."